MSI's MOUNTAIN WETLAND PROGRAM has several components aimed at improving the understanding of wetland hydro-ecology, ecological health, spatial distribution, and impacts of human activities, and communicating this information to land managers and the public. Of these, the fen project is an integral piece of mountain wetland monitoring. Fens in the San Juan Mountains have accumulated up to three meters of peat and most are thousands of years old. These wetlands store carbon, filter pollutants from water, and support biodiversity, including rare species. Fens are abundant in the San Juans because the combination of snowmelt and late summer monsoon rains provide ample moisture. Fens face threats from the development of mountain watersheds and from climate change. Both can alter the amount of water that reaches the fen and can cause the wetland to dry out. The Fen Project is a result of the San Juan Fen Partnership. The goal of the Ophir Pass Fen Restoration Project, now moving into it’s sixth year, is to restore the hydrologic and ecological function of the fen from historical mining and other disturbances. Specifically, the project aims to: (1) restore hydrological and ecological function of the fen, (2) reduce metal loading from sediment eroding into Mineral Creek, and (3) advance the state of practice for fen/wetland restoration in mountain environments. 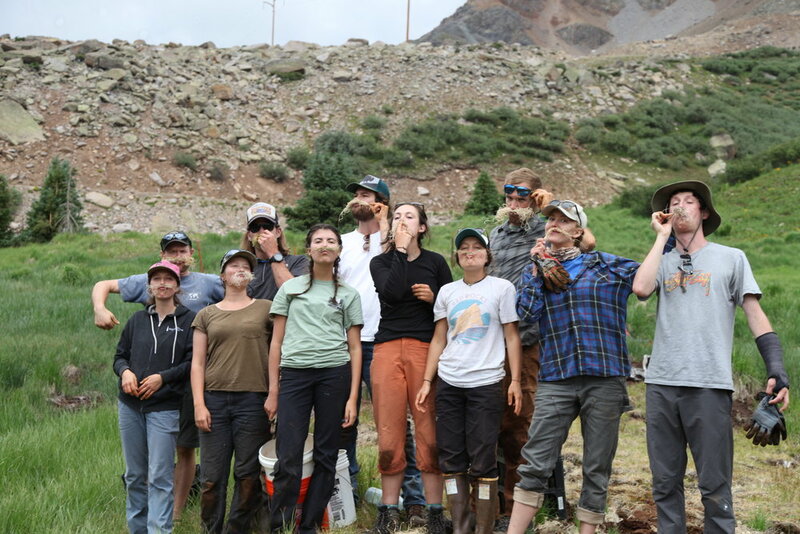 The collaboration combined efforts of MSI, Michigan Technological University, Durango Mountain Land, National Forest Foundation, San Juan National Forest, Colorado Mountain Club, San Juan Citizens Alliance, and many volunteer partners. After inspecting past mitigation work, the erosion controls, ditch dams, and transplanted vegetation all appear to be effective. In summer of 2018, we planted four species: Carex microptera, C. utriculata, C. norvegica, C. aquatilis, and Calamagrostis canadensis across Ophir Fen. In total, our volunteers put 1,379 greenhouse cultivated seedling plugs in the ground. These plugs were grown in a greenhouse over the winter from seed collected at Ophir Pass in 2017 (AlpineEco Nursery, Salida, CO). In addition to helping with planting plugs of these native sedges, volunteers also helped with installing erosion controls, while learning firsthand about wetland restoration and ecology. Titled the “Durango Mountain Land Wetland Mitigation and Monitoring Plan at the Chattanooga Fen and Ophir Pass Fen,” the principal goal is to ensure a “no net loss” of wetland functions within the Animas Watershed. This is achieved via the restoration of natural hydrology in order to support fen vegetation, cease erosion, stabilize peat soils, and revegetate non-vegetated areas. This plan, approved by the U. S. Army Corp of Engineers in 2012 included two phases: Phase I (1.30 acres) success criteria was met 100% in 2014; Phase II (0.97 acres) construction occurred on June 22-26, 2013. In total, 563 linear feet of ditches were restored. In addition to helping with planting plugs of these native sedges, volunteers also helped with installing erosion controls, while learning firsthand about wetland restoration and ecology. MSI and SJNF staff planted approximately 300 willow poles on October 21, 2018 to augment vegetative cover. Hydrologic monitoring also took place as part of the fen restoration efforts, which included regular groundwater well measurements and precipitation data acquired from SNOTEL site 713 on Red Mountain Pass. Vegetation was inspected where mitigation activities have occurred during Phase I and Phase II. The vegetation plots are monitored annually to determine the plant community composition and canopy cover. As hydrology changes post-restoration, species composition may change in plots below the ditches as the water table stabilizes over the next 5-10 years.